Just because you’re trying to eat healthy doesn’t mean you can’t have dessert. You just have to choose carefully. High fat ingredients contain saturated fat and they can cause higher cholesterol levels in the body. Desserts and sweets don’t have the nutritional value that other foods do, but if you stick with healthier recipes and less-frequent, reasonable portions, desserts can fit into your healthy eating plan. Make fruit a part of your dessert menu as much as possible, whether it is the dessert itself or is part of a recipe. 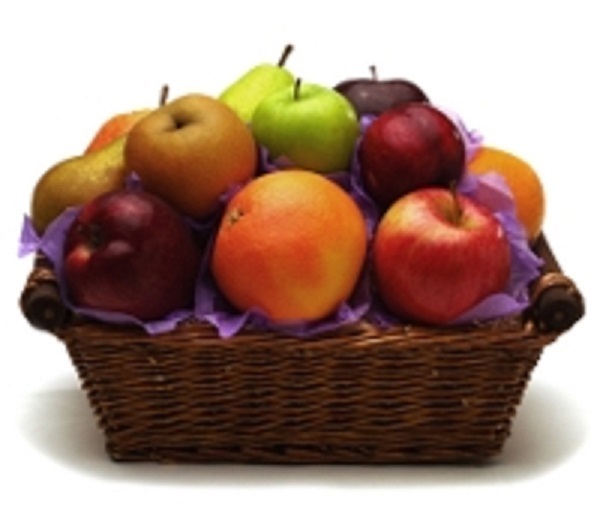 Although fruit is high in carbohydrates, it’s also filled with vitamins, minerals and fiber. If you crave something more, try adding fruit to sugar-free gelatin or mixing up a quick fruit salad. You will be amazed at how delicious these healthy dessert recipes taste. Place dates in a bowl and pour 1/2 cup boiling water over them. Let soak 15 minutes, then transfer dates and water to a blender and puree until smooth to make a date syrup. Bring rice and almond milk to a boil in a medium saucepan. Reduce heat to medium-low and simmer until rice is cooked and has absorbed most of the almond milk, stirring occasionally, about 45 minutes. Stir date syrup, raisins, vanilla extract, almond extract, cinnamon and almonds into the cooked rice and serve warm or cold. Combine peanuts and oats in the bowl of a food processor. Pulse about 25 times to create a coarse meal. Add cocoa and salt and pulse a few more times to combine. Put pumpkin purée and peanut butter in the bowl of a stand mixer fitted with a paddle attachment. Mix on medium speed until the peanut butter and pumpkin are incorporated, scraping down the sides of the bowl as necessary, about 2 minutes. Add vanilla and dates and mix until combined, about 1 minute. On low-speed, slowly add the dry ingredients to the peanut butter mixture. Mix until completely combined, forming a dense dough. Scoop up tablespoons of dough and roll them into balls. Arrange on the prepared baking sheets about 1 inch apart. Press down on the balls with the back of a fork first in one direction and then in the other to form a checkerboard design on each cookie. Bake until the cookies are firm and dried, about 12 minutes. Cool cookies on the baking sheets for 2 minutes, then transfer to a wire rack to cool completely. Place cooled cookies in an airtight container and store at room temperature up to 4 days or refrigerate up to 1 week. Preheat the oven to 350°F. Oil an 8 x 8-inch baking pan and line the bottom with parchment paper. In a medium bowl, make the crumb topping by combining 1 cup carrots, 1/4 cup almond flour, 1/4 cup all-purpose flour, 1/4 cup sugar and 1 tablespoon oil; set aside. In a large bowl, whisk together remaining 1 1/2 cups almond flour and the 1 cup all-purpose flour, baking powder, baking soda and salt. In a second large bowl, whisk together sour cream, vanilla, eggs, remaining 3/4 cup sugar and remaining oil. Add flour mixture to the large bowl and whisk again until incorporated; fold in the remaining 2 cups carrots. Transfer to the prepared pan and scatter crumb topping over the top. Bake until the cake springs back in the middle when pressed, and is deep golden brown, 50 to 60 minutes. Set aside to let cool until warm, then remove from the pan and transfer to a plate, discarding the parchment paper. Cut into squares or wedges and serve. Preheat the oven to 400°F. Prick sweet potatoes with a fork and place them on a rimmed baking sheet lined with parchment paper. Bake about 1 hour or until very tender. Remove from the oven and let cool. Line pastry shell with parchment paper or foil and fill with pie weights or dried beans. Bake on the lower rack of the oven about 15 minutes or until just starting to set. Remove the weights and continue to bake 10 to 12 minutes or until lightly golden. Cool on a wire rack 10 minutes. Meanwhile, peel sweet potatoes and transfer flesh to the bowl of a food processor. Discard skins. Process until potatoes are puréed. Transfer 1 1/4 cups purée to a large bowl. Add milk, sugar, flour, eggs, cinnamon, ginger, nutmeg and salt and whisk until combined and smooth. Layer apple slices in concentric circles in the bottom of the cooled crust. Pour sweet potato filling into the crust over the apples. Bake about 50 minutes or until just set in the center of the pie. Let cool to room temperature on a wire rack. Serve or chill in the refrigerator until ready to serve. In a medium bowl combine oats, flour, 2 tablespoons brown sugar and cinnamon. Mix with a fork until combined. Add the butter and work it in with your fingers, a fork or a pastry blender until the mixture begins to form clumps. In a large bowl toss the pears with the water, lemon juice and remaining 1 tablespoon brown sugar. Transfer pear mixture to a 9-inch pie plate. Sprinkle the oat mixture evenly over the pears. Bake for 40 to 45 minutes or until the topping is golden and the pears are tender. If desired, serve warm with frozen yogurt. To make individual servings, prepare as above, except divide the pear mixture among six 6-ounce custard cups or ramekins. 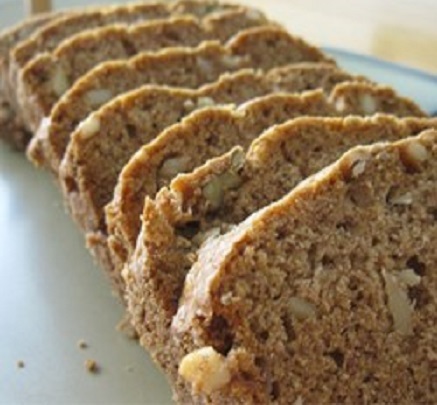 Sprinkle with oat mixture and bake about 35 minutes or until the pears are tender. Serve as above. Look for apples that are firm, brightly colored and free of bruises. The skin should be clean and shiny; a dull finish indicates the fruit may be past its prime. Refrigerate apples up to two weeks. At room temperature, they ripen too quickly and become mealy. Apples are also good baked in pies, roasted or sautéed to accompany meat dishes. Look for grapes that are plump, unblemished and firmly attached to a flexible stem. Ripe white and green grapes should have a yellowish cast; red and purple ones should have no green. Refrigerate grapes in a ventilated plastic bag up to one week. Pears ripen off the tree, so most of the fruit you’ll find at the market will need a few days to soften at home. Common varieties include: Anjou, which is egg-shaped with a green, rose-tinged green, or red skin; Bosc, which has a slender neck and a brown skin (Boscs are flavorful even before fully ripe so they are good for cooking); and Bartlett, which has a red skin or a green skin that yellows as it ripens. Let pears ripen at room temperature. When they’re ready to eat, the flesh on the neck of the fruit will give a little when pressed. Refrigerate ripe pears for up to five days. Cooking can really bring out their flavor, so try them baked or poached. This slightly sour fruit has gotten a lot of press as an antioxidant powerhouse. The juice provides a tangy base for marinades and the seeds can be mixed into salads to give them flavor. This Middle Eastern favorite is a sweet fruit that is perfect braised in stews, chopped up in desserts, stuffed with cream cheese or almonds or baked into quick breads. Use this sweet fruit to add a tropical flavor to your recipes. It’s great mixed with other fruits for a fruit salad or combined with pineapple to make a tangy chutney. Preheat oven to 350 degrees F. Lightly coat an 8 x 8 x 2-inch baking pan with cooking spray. Set aside. In a small saucepan combine milk, dates and salt; heat until steaming but do not boil. Remove from the heat. Stir in apple and vanilla; cool to room temperature. Whisk in egg and oil and stir until combined. Set aside. In a small bowl stir together pecans, brown sugar, butter, the 1 teaspoon flour and the cinnamon; set aside. In a medium bowl whisk together the 1-1/2 cups flour, the baking powder and baking soda. Add milk mixture all at once to the flour mixture. Stir just until combined. Spoon batter into the prepared baking pan. Sprinkle evenly with the pecan topping mixture. Generously butter and flour a 9 inch springform pan, tapping out any excess flour. Set aside. In the bowl of an electric mixer fitted with a whisk, beat the eggs and sugar until thick and lemon-colored, about 3 minutes. Add the butter, oil, milk and vanilla extract and mix until blended. Sift the flour, baking powder and salt into a large bowl. Add the lemon zest and orange zest, and toss to coat the zest with the flour. Spoon the mixture into the bowl of batter and stir with a wooden spoon until thoroughly blended. Scrape down the sides of the bowl and mix once more. Set aside for 10 minutes to allow the flour to absorb the liquids. Stir about 3/4 of the grapes into the batter. Spoon the batter into the prepared cake pan and smooth out the top with a spatula. Place the pan in the center of the oven. 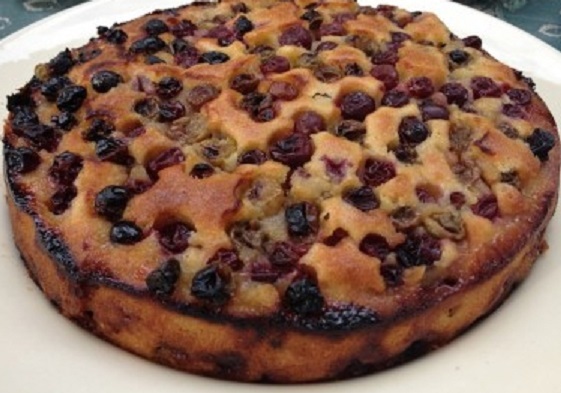 Bake for 15 minutes, then sprinkle the top of the cake with the remaining grapes. Bake until the top is a deep golden brown and the cake feels quite firm when pressed with a fingertip, about 40 minutes more, for a total baking time of 55 minutes. Remove to a rack to cool. After 10 minutes, run a knife along the sides of the pan. Release and remove the side of the springform pan, leaving the cake on the pan base. Sprinkle with confectioners’ sugar just before serving. Serve at room temperature. Cut the cake into thin wedges. Mix together molasses, honey, egg white, buttermilk and oil in a small bowl or glass measuring cup. Mix flour, bran, sugar, baking soda and salt in a mixing bowl and add the wet mixture all at once. Stir in the chopped pears and walnuts. 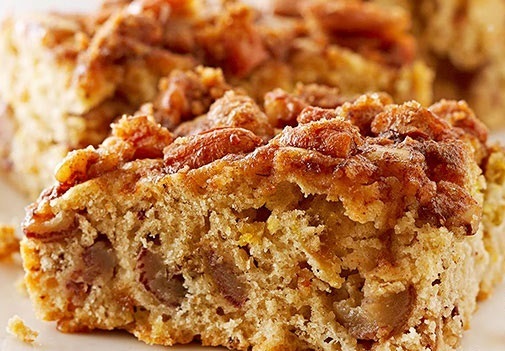 Pour into a 9 x 5-inch lightly greased baking pan. Bake at 350°F for 60 to 70 minutes, or until the bread tests done (cake tester inserted in middle of loaf comes out clean). Makes 1 large loaf. In a bowl, mix flour, 2/3 cup sugar, baking powder and salt. Stir in crystallized ginger, lemon peel and pomegranate seeds. Make a well in the center. In a measuring cup, blend milk, egg and melted butter. Pour mixture all at once into the well in the bowl with the flour mixture. Stir just until batter is moistened; it will be lumpy. Spoon batter into 12 (2 1/2-in.-wide) or 24 (1 3/4-in.-wide) buttered mini muffin cups, filling each almost to the rim. Sprinkle the tops of each muffin with granulated sugar. Bake in a 425°F oven until lightly browned, about 16 minutes for the large muffin pan or 13 minutes for the small muffin pan. 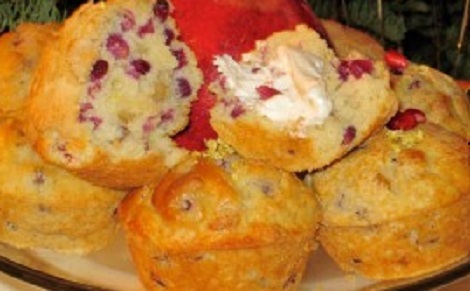 Remove muffins from the pan immediately and cool on a wire rack. Combine crumbs, 1/4 cup crystallized ginger and melted butter. Pat crumb mixture evenly the over bottom of a removable-rim 8-inch cheesecake pan. Bake in a 350°F oven until the crust is lightly brown, 10 to 12 minutes. In a blender or food processor, process ricotta cheese, egg whites and lemon juice until very smooth. In a mixing bowl, stir together yogurt, sugar, lemon peel and vanilla. Add ricotta mixture and stir until well blended (the mixture is thin). Pour into the (hot or cool) crust. Bake in a 350°F oven until the center barely jiggles when cake is gently shaken, 50 to 55 minutes. Run a thin-bladed knife between cake and pan rim. Remove pan rim. 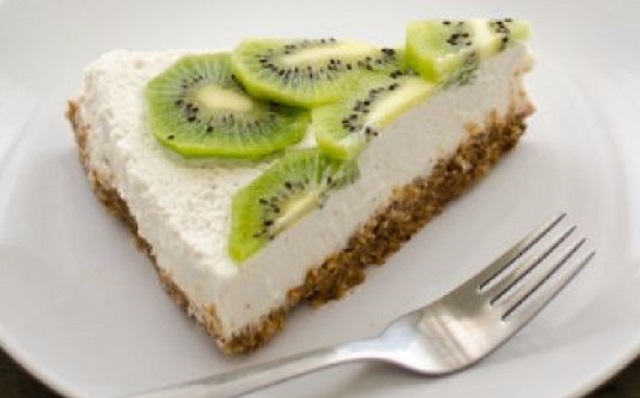 Peel kiwi fruit and slice crosswise. 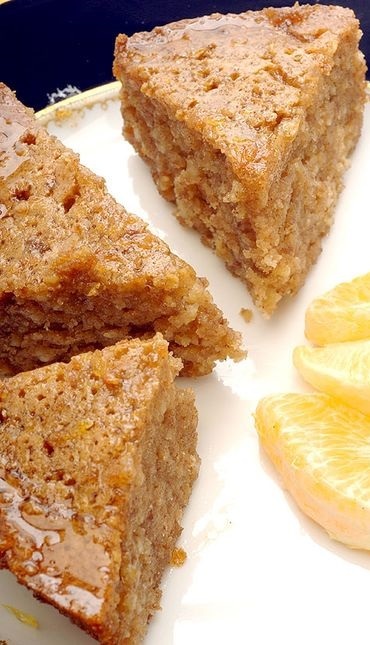 Arrange fruit in a ring in overlapping slices on top of the cake and sprinkle with remaining ginger. Cut cake into wedges. 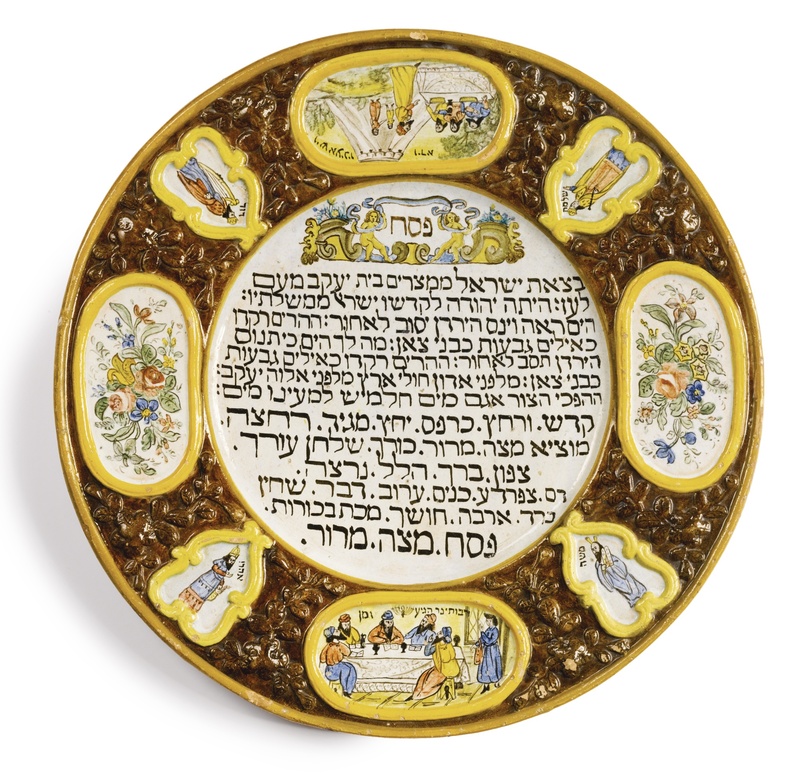 The center with the Kiddush and the order of the Seder, surrounded by wide molded rim with scenes of Joseph Greeting his Brothers and the Passover Meal in Egypt, four heroes (Moses, Aaron, Solomon, David), and two floral plaques in molded borders, late 19th century. The Jewish people celebrate Passover as a commemoration of their liberation over 3,300 years ago from slavery in ancient Egypt. When the Pharaoh freed the Israelites, it is said that they left in such a hurry that they could not wait for bread dough to rise. For the duration of Passover no leavened bread is eaten and that is why Passover is also called “The Festival of the Unleavened Bread”. Matzo (flat unleavened bread) is a symbol of the holiday. Other scholars teach that in the time of the Exodus, matzo was commonly baked for the purpose of traveling because it did not spoil and was light to carry, suggesting that matzo was baked intentionally for the long journey ahead. It is traditional for Jewish families to gather on the first night of Passover for a special dinner called a seder. The table is set with the finest china and silverware to reflect the importance of the meal. During this meal, the story of the Exodus from Egypt is retold using a special text called the Haggadah. The Passover seder is one of the great traditions of the Jewish faith. Following the pre-meal chants, the charoset is passed around. “With unleavened bread and bitter herbs they shall eat it,” is recited while biting into the Passover matzo, horseradish and charoset. 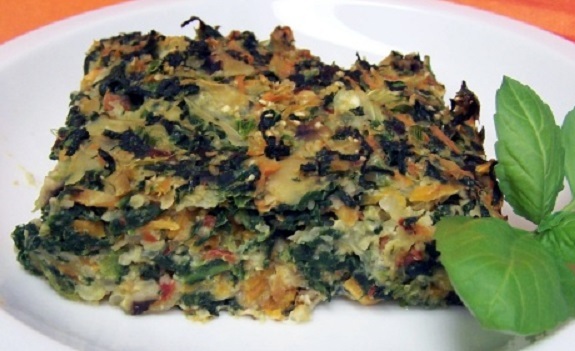 One of the most revered of Jewish dishes, it closes the ceremony and begins the feast. 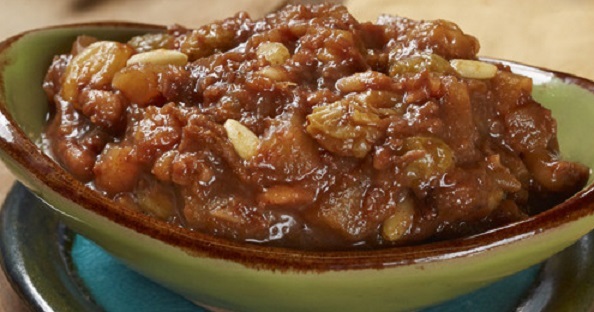 Charoset is a dense fruit paste that represents the mortar used by the ancient Hebrew slaves in Egypt to make bricks. People rarely associate Judaism with Italy, probably because Rome has hosted the seat of the Catholic Church for close to 2000 years. Jews arrived long before the Christians, however. Jewish traders built one of the first synagogues in Ostia Antica (an area just outside of present day Rome) during the second century BC. With time the Jewish population grew and swelled and historians have calculated that by the reign of Tiberius (14-37 AD), there were more than 50,000 Jews living in Rome and dozens of Jewish communities scattered throughout the Roman territory. Like their fellow countrymen, Italian Jews suffered through thousands of years of invasions that followed the fall of the Roman Empire, but they managed to live fairly peacefully in Italy almost everywhere — from Venice, where the Isola della Giudecca (across the canal from Piazza San Marco) is so named because it was the home of many Jews, to the Arab lands of southern Italy. At least until 1492, when the Spaniards drove the Arabs back across the Mediterranean Sea into Africa and turned the liberated territories of Sicily and Southern Italy over to the Inquisition. Southern Italian Jews fled north to more tolerant regions, where they were joined by Jews from other parts of Europe as well. 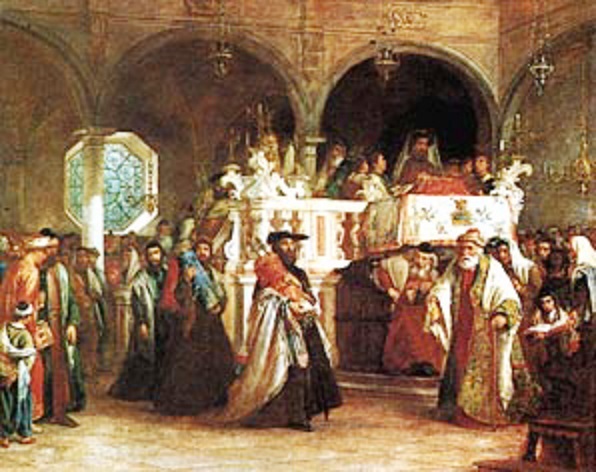 Florence, Torino, Mantova and Bologna all had strong Jewish communities during the renaissance. Because Passover celebrates freedom, a small amount of charoset is placed on the seder plate as a reminder to Jews that they were once slaves and they should not take their freedom for granted. In Italy there are various regional versions of haroset. The haroset of Padua has prunes, raisins, dates, walnuts, apples and chestnuts. In Milan they make it with apples, pears, dates, almonds, bananas and orange juice. Other possible additions include: chopped lemon or candied orange peel, walnuts, pistachios, dried figs, orange or lemon juice, ginger, nutmeg and cloves. Peel and core the apple and pears and cut them in small pieces. Put all the ingredients into a pan together and cook, stirring occasionally, for about an hour, until the fruits are very soft, adding a little water, if it becomes too thick. Cut a round of parchment paper to fit just inside a wide heavy 6-to 8-quart pan, then set the paper round aside. Simmer water, lemon juice, oil, honey, 3/4 teaspoon salt, and 1/2 teaspoon pepper in the pan, stirring, until the honey has dissolved. Stir in celery (but not leaves) and cover with the parchment round. Simmer until tender and liquid is reduced to about 1/4 cup, 35 to 40 minutes. Meanwhile, coarsely chop reserved leaves. 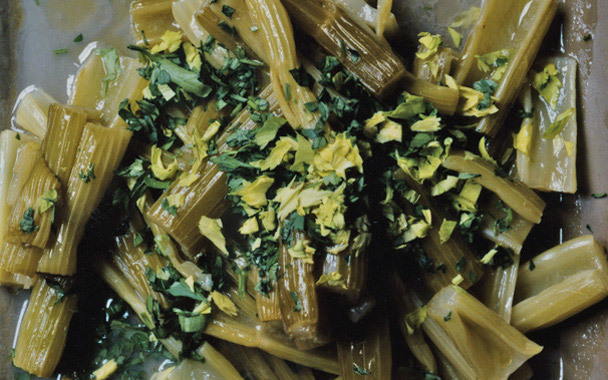 Serve celery sprinkled with celery leaves and parsley. Sprinkle chicken with salt and pepper. Heat oil in a large Dutch oven over high heat. Add chicken; cook 3 minutes on each side or until browned. Remove chicken from pan and set aside. Add onion and garlic to the pan; cook 30 seconds, stirring constantly. 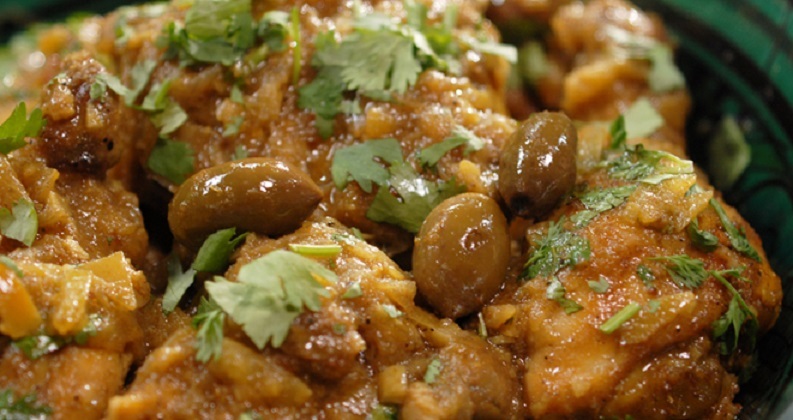 Add browned chicken, broth, olives, cinnamon, ginger and coriander; bring to a boil. Cover, reduce heat, and simmer for 45 minutes. Turn chicken over; cook, uncovered for 15 minutes. Remove the chicken from the pan with a slotted spoon; place 1 chicken piece on each of 4 plates. Add lemon zest, juice, and parsley to the pan; cook for 30 seconds, stirring constantly. Spoon sauce over chicken. Preheat the oven to 375 degrees. Grease 9 x 13 inch oven proof dish. In a large, nonstick skillet, sauté the fresh vegetables in oil 3-5 minutes. Add drained spinach. Pour boiling water over farfel (in a strainer) to moisten. Add farfel, vegetables, salt, pepper and nuts. Cool. Beat egg whites until stiff and fold into the farfel mixture. Sprinkle with paprika. Bake 45 minutes or longer until browned. Preheat the oven to 350°F. Generously grease a 7-inch round layer cake pan. (If you do not have one that size, you can use a round foil pan of the same or similar size available in the supermarket baking aisle). Bake for 35 to 40 minutes, or until the top is light brown and set. Cool for at least 20 minutes. Meanwhile, prepare the Soaking Syrup. In a medium saucepan, combine all the ingredients. Heat to dissolve the sugar and simmer for 5 to 10 minutes, until the mixture becomes syrupy. Cool well. Pour the cooled syrup over the cooled cake, poking holes in the cake with a fork, to permit the syrup to penetrate. Allow it to stand for 2 to 4 hours to absorb the syrup. Refrigerating this cake while it is absorbing the liquid helps the cake to firm up, which makes it easier to cut.